Rural communities were characterized for hundreds of years by a multitude of artisanal crafts, tightly intertwined in the lives and work of farming families. Blacksmiths and carpenters were the most numerous, as their work was indispensable for the construction and repair of agricultural tools. Blacksmith workshops (frab) could be found in every town, village and large farm complex. They were often adjacent to joineries with which they collaborated to produce a large number of articles. The work of blacksmiths was conditioned by their location with respect to residential centers and to communication routes, requiring them to specialize within their trade. For example, a workshop found along a road frequently traveled by carts had to above all forge horseshoes, repair wheel rims and fix bearings. A blacksmith situated within a large farm, usually far from a residential area, had less varied, but more constant work that was entirely linked to the fortune of the farm. Every rural village had a farrier (marschèlch). His tools were similar to those of the blacksmith: forge, anvil, hammer, gouge and pincers. His work included the forging of horseshoes of various dimensions that would be fitted with fire for the hooves of horses, mules and donkeys. Woodwork was among the most important crafts of the countryside, as it produced farming tools, furniture and home utensils. Every village and large farm complex had its carpenter (falegnàm). He was a respected figure and assigned the role of arbiter in estimating family wealth for legal documents such as wills. Villages also contained the workshops of other specialized wood-workers such as coopers (butèr), lathe turners (turnidaur) and wainwrights (marangan), who attracted clients from afar with the quality of their work. Wainwrights also maintained consistent stocks of aged wood, so they were always ready to fill orders for a carriage, cart or, above all, a wagon. This latter vehicle was costly but indispensable for farming and required by the sharecropping contracts. Tenant farmers turned to famous wainwrights – including local dynasties such as Bassi, Borghi, Dalla, Poggi, Toselli - for the construction of robust carts with artistic carvings, requiring notable economic sacrifice. Many other artisans did not have workshops but instead travelled seasonally to provide families with objects necessary for work, animals or the transformation of products. These artisans included: knife-grinders (agozz), gargiolai or hemp combers, (garżulèr/canapéṅ/coṅza canva), cord makers (curdèr), sawyers (sgantén), basket makers (panirèr), pork butchers (castréṅ). Other craftsmen were related to domestic life: tinkers (batràm/stagnén), mattress-makers (tamarazèr) and chairblers (scranèr). Still others offered services for personal care: tailors (sèrt), cobblers (calzulèr), barbers (barbìr). Rural artisans were the expression of a pre-industrial society and demand for their work began to decline toward the end of the 1800s, with the increasing mechanization of agriculture and the serial production of tools and equipment. Nevertheless, these crafts were still practiced until the threshold of the “Italian economic miracle” of the 1950s. 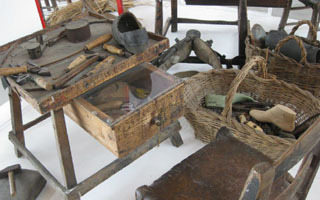 On display are furniture, tools and products found in artisanal workshops employing iron and wood as well as those belonging to travelling artisans. 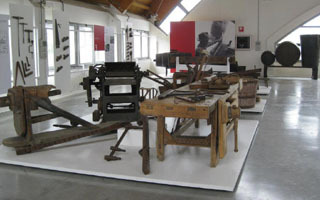 The exhibit features a steam-operated threshing machine as testament to the work of the machinist (machinésta) and an inlaid farm cart bearing the inscription that it was made for Ferdinando Loli by cartmarker Saverio Dalla in 1892. A large mill wheel from the Moline canal of Bologna evokes the work of the miller (muner).